It's Powered By a TwinPower, Turbocharged Six-Cylinder Clean Diesel Engine. Instead of the high-revving turbocharged straight six found in the 335i, the 335d comes with a very low-revving, 3.0-liter inline six that runs on diesel fuel. The engine uses what BMW calls "TwinPower Turbo" technology, which employs a single turbo that can produce the power of two. 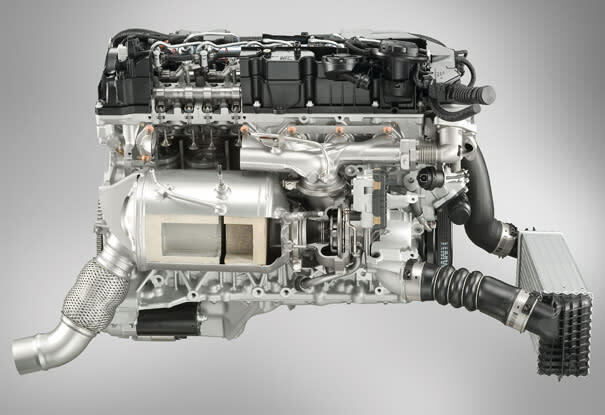 BMW marks this engine as its cleanest diesel engine ever, thanks to its Blue Performance technology. The Blue Performance is really a blue liquid that gets deposited into the car's exhaust, where it cleans the usually dirty diesel exhaust fumes, causing the motor to put out 20% less CO2 than a comparable gasoline engine.